Our Basic Civil Engineering Tests allow you to experience an online examination in the real-time environment. In every online test on Basic Civil Engineering, you will be presented with Multiple Choice Questions (MCQs) which will test your skills in Basic Civil Engineering Concepts in a detailed and comprehensive manner. In the test, each question will have 4 options to choose from. You should select only 1 correct option as an answer and then move on to the next question. Once you submit answers to all the questions, you will be given your final test score. In the Online Basic Civil Engineering Test, for every correct answer, you will be given 2 points. There will also be negative marking of -1 for every wrong answer. So, you will have to be more careful in choosing the answers to the question in your online examination. If needed, you should skip to the next question and come back to the previous question later so that you can do proper time management for the online mock tests. 1. "Basic Civil Engineering Practice Tests" - In Basic Civil Engineering practice tests, there will be a series of practice tests wherein you can test your Basic Civil Engineering concepts on every chapter separately. There will not be any time limit on these tests. So, Basic Civil Engineering Practice Tests should be the first set of tests which you should attempt. Goto these practice tests here. 2. 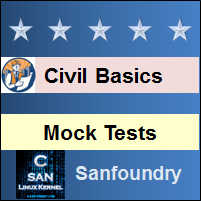 "Basic Civil Engineering Mock Tests" - In Basic Civil Engineering mock tests, there will be a series of mock tests wherein you can test your Basic Civil Engineering concepts on every chapter separately, but there will be a fixed time limit per test. So, it is similar to Basic Civil Engineering Practice Tests, but with an added constraint of time limits. You should try Basic Civil Engineering Mock Tests if you are appearing for any online examination soon. Goto these mock tests here. 3. 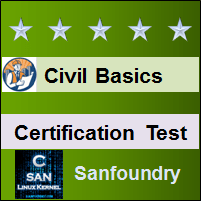 "Basic Civil Engineering Certification Test" - Once you are through with your Basic Civil Engineering concepts, then you should try our Basic Civil Engineering Certification Test wherein Sanfoundry will issue a free Certificate to you if you scored either Grade A* or Grade A in Basic Civil Engineering Certification Test. Goto Basic Civil Engineering Certification test here. 4. "Basic Civil Engineering Internship Test" - If you are interested to do Internships in Basic Civil Engineering at Sanfoundry, then you must take our Basic Civil Engineering Internship Test. 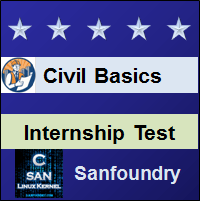 If you scored either Grade A* or Grade A in Basic Civil Engineering Internship Test, then you are eligible for Internship at Sanfoundry in Basic Civil Engineering. Goto Basic Civil Engineering Internship test here. 5. 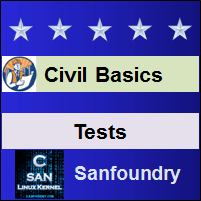 "Basic Civil Engineering Job Test" - If you are a fresher, a dropout, an experienced person and if you know Basic Civil Engineering well and looking out for jobs in Basic Civil Engineering domain at Sanfoundry (or our Network of Companies), then you should try and qualify our "Basic Civil Engineering Job Test". 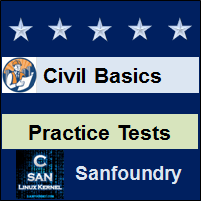 If you scored either Grade A* or Grade A in Basic Civil Engineering Job Test, then you are eligible for a Job at Sanfoundry (or our Network) in Basic Civil Engineering domain. Goto Basic Civil Engineering Job test here. For every "Basic Civil Engineering Practice Test", Total Questions: 20, Total Time: Unlimited. For every "Basic Civil Engineering Mock Test", Total Questions: 20, Total Time: 20 Minutes. For "Basic Civil Engineering Certification Test", Total Questions: 50, Total Time: 1 hour. For "Basic Civil Engineering Internship Test", Total Questions: 50, Total Time: 1 hour. For "Basic Civil Engineering Job Test", Total Questions: 50, Total Time: 1 hour. Before you get started on these series of online tests on Basic Civil Engineering, you should learn, study and practice our collection of 1000 MCQs (Multiple Choice Questions and Answers) on Basic Civil Engineering here. We also prefer that you should practice Basic Civil Engineering practice tests and mock tests completely before attempting the certification test. Here is the list of online practice tests and mock tests on Basic Civil Engineering. Each online test focuses on a "Specific chapter of Basic Civil Engineering". So, you should try both practice test and mock test on every chapter to do a self-assessment of your knowledge (along with time-limit constraints) in every area or sub-topic of Basic Civil Engineering. Basic Civil Engineering Certification test, Internship test, and Job Test are mentioned at the end of this list. 1. Basic Civil Engineering Test 1 – This set of online test on “Basic Civil Engineering” tests your skills on Source and Classification of Stones, Quarrying and Dressing of Stones, Â Properties of Stones, Tests on Stones, Source and Classification of Sand, Bulking of Sand, Properties of Sand, Source and Classification of Lime, Calcination and Slaking of Lime. 2. Basic Civil Engineering Test 2 – This set of online test on “Basic Civil Engineering” tests your skills on Properties of Cement, Ingredients of Cement, Manufacture of Cement, Types of Cement and Uses, Grades of Cement, Composition of Good Brick Earth, Manufacture of Brick, Qualities of Good Brick, Types of Bricks, Tests on Bricks. 3. Basic Civil Engineering Test 3 – This set of online test on “Basic Civil Engineering” tests your skills on Types of Tiles, Manufacture of Tiles, Â Classification of Timber, Â QualitiesÂ of Timber, Â Seasoning of Timber, Defects and Preservation of Timber, Manufacture of Timber, Market Forms and Uses of Steel, Properties and Uses of Aluminium. 4. Basic Civil Engineering Test 4 – This set of online test on “Basic Civil Engineering” tests your skills on Characteristics and Ingredients of Paint, Types and Uses of Paints, Varnish, Â Fine Aggregates, Coarse Aggregates, Sieve AnalysisÂ, Glass, Rubber, PVC. 5. Basic Civil Engineering Test 5 – This set of online test on “Basic Civil Engineering” tests your skills on Adhesives, Cost EffectiveÂ Materials, Types of Structures, Components of Building, Foundation, Mortar, Stone Masonry, Brick Masonry, Composition of Concrete. 6. Basic Civil Engineering Test 6 – This set of online test on “Basic Civil Engineering” tests your skills on Manufacture of Concrete, Properties of Concrete, Tests on Concrete, Doors and Windows, Roof Types, Roof Coverings, Floor Types, Floor Coverings, Stairs. 7. Basic Civil Engineering Test 7 – This set of online test on “Basic Civil Engineering” tests your skills on Plastering, Painting, Damp Proofing, RCC, PSC and Ferro-Cement, Building Services, Building Maintenance, Cost Effective Construction Techniques, Â Basic Surveying Terms, Chain Surveying, Compass Surveying. 8. Basic Civil Engineering Test 8 – This set of online test on “Basic Civil Engineering” tests your skills on Plane Table Surveying, Equipments Used in Levelling, Methods of Levelling, Contouring, EDM – Total Station, Environmental Engineering, Wastewater Management, Solid Waste Management, Sustainable Engineering. 9. Basic Civil Engineering Test 9 – This set of online test on “Basic Civil Engineering” tests your skills on Various Cycles of Environment, Biodiversity and Ecology, Geotechnical Engineering, Soil Properties, Geotechnical Investigation and Geosynthetics, Highway Engineering, Railway Engineering, Â Port and Harbour Engineering, Airport Engineering. 10. Basic Civil Engineering Test 10 – This set of online test on “Basic Civil Engineering” tests your skills on Urban Engineering, Types of Irrigation, Dams, Weirs, Impact Assessment, Computer-Aided Design, AutoCAD, Disaster Management and Planning, IS Codes. 11. Basic Civil Engineering Certification Test - This set of online free certification test on "Basic Civil Engineering" tests your skills on all areas (all chapters, topics and subtopics) of Basic Civil Engineering. 12. Basic Civil Engineering Internship Test - If you scored either Grade A* or Grade A in our Basic Civil Engineering Internship Test, then you can apply for Internship at Sanfoundry in Basic Civil Engineering. 13. 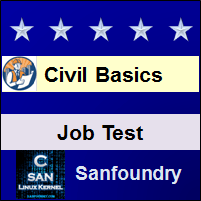 Basic Civil Engineering Job Test - If you scored either Grade A* or Grade A in our Basic Civil Engineering Job Test, then you can apply for Jobs at Sanfoundry in Basic Civil Engineering domain. Best Wishes for your Basic Civil Engineering Tests!